“I had a lot of support from my friends and coaches. Forming the club with the help of ASUMW was very straightforward. We now have an acre of land for us to practice with a storage shed on it for our equipment,” she said. 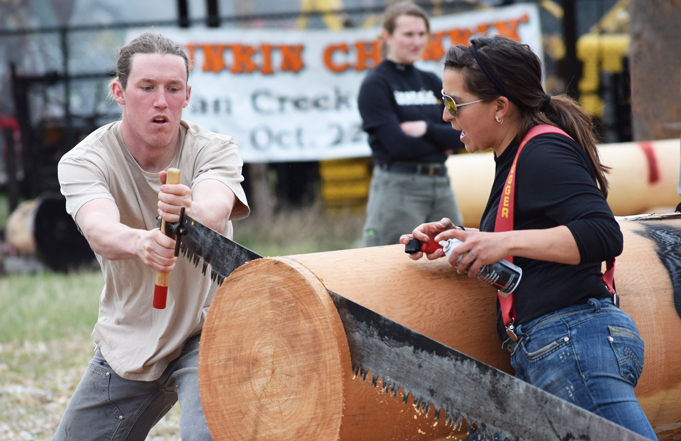 Timber, or logging, sports involve competitions that include chopping, sawing, and balancing on wood, both as individuals and teams. The equipment required can make it an expensive sport, but, fittingly, the club raises funds for their various costs by selling firewood. Last year, they were able to raise $3,000 dollars this way, but the money is used for much more than the group’s travel expenses. “We’re trying to focus on community service and giving back to the community. We’re going to start sending 30% of our lumber sales to the animal shelter and every 5th cord will be donated to the Dillon Wood Bank,” McGowan said. The Dillon Firewood Bank is a charitable organization that provides families in need with fuel to warm their homes during Montana’s winter months. Along with their acts of community service, the club members have also been staying active in competitions over the past two years. “Primarily, our competitions take place in Montana and Idaho. The University of Idaho puts on a show every year in Moscow. Flathead puts on one in Kalispell. Missoula has a Woodsmen team. They have a log rolling competition in the winter. They will also have a pro/amateur competition where they switch off between professional and college competitors. It’s exciting to hang out with the pros and get tips from them,” McGowan said. McGowan has previously conducted trail work and fought fires for the Forest Service. She believes her time spent in logging sports helped her greatly to hone her skills and is good experience for anyone interested in similar field-work. Lastly, McGowan wanted to invite any interested students to join the club that brings her so much joy. For more information or to join the club, contact Erin McGowan by email at erin.mcgowan@umwestern.edu.